The American Passenger Rail Heritage Foundation is proud to announce that its’ Rail Rangers program will be back for a third season of trips. 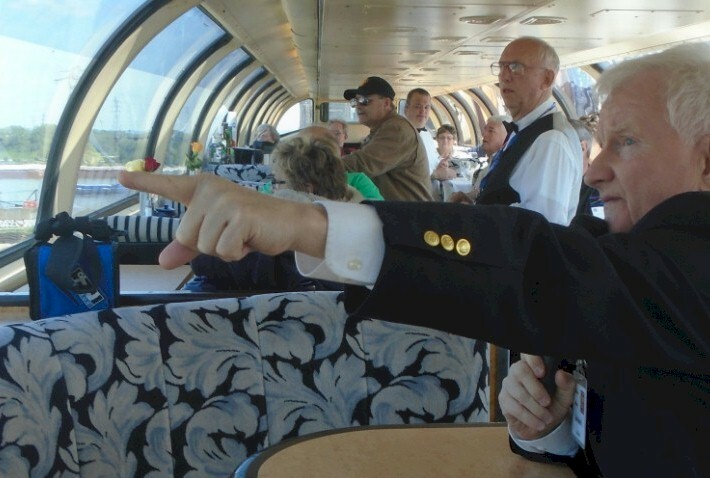 Passengers on select private rail excursions will once again to be treated to educational, but also fun, live narration by our experienced Interpretive Guides. Some excursions will also feature complimentary route guide sheets and/or detailed milepost-by-milepost route guidebooks available for purchase… plus our Junior Rail Rangers programs for children and teenagers. Those who read the blog posts here on TrainWeb, like you, are being given a “sneak peek” at our trips and a special chance to purchase tickets while seats are still available (act fast, though, because we expect several of these trips to “sell out” very quickly once word gets out!). 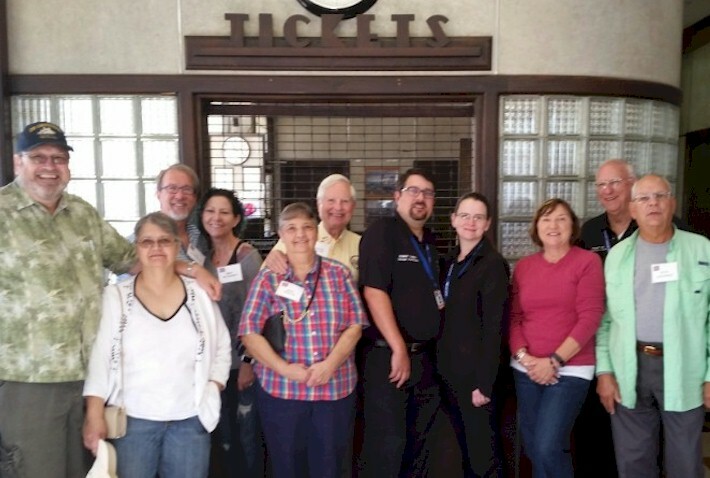 The Rail Rangers program was established on July 20, 2015, with the mission of being an outreach of the APRHF beyond La Plata, Missouri, providing an enhanced experience for passengers on private rail excursions. Our current partners in this effort include: Friends of the 261 (Minneapolis, MN); Zephyr Route (St. Charles, IL); American Rail Excursions (Madison, IL); Friends of the Cumbres & Toltec Scenic Railroad (New Mexico); and Paxrail (Chicago, IL). Rail Rangers is managed by the APRHF’s Board of Directors in cooperation with private railcar owners and excursion organizers. Between December 2012 and July 2015, the APRHF was a co-sponsor of a National Park Service Trails & Rails program that provided interpretive guides on Amtrak’s Southwest Chief between Chicago and La Plata, Missouri. For the past three months now, the APRHF Rail Rangers have had our Interpretive Guides on the Hoosier State between Lafayette, Indiana and Chicago, Illinois on select Sunday mornings. Passengers have enjoyed learning about such things as the Battle of Tippecanoe, interesting Hoosiers such as David Letterman and Orville Redenbacher, and knowing they are traveling on the same route that Abraham Lincoln’s funeral train operated on in 1865 (Lafayette to Monon). This program has been a partnership between the Indiana Department of Transportation and the Iowa Pacific Railroad, and co-sponsored by the Hilton Garden Inn and Campus Inn Motel in West Lafayette, Indiana. With Iowa Pacific no longer providing the onboard services for this train after February 28th, our final “Riding the Hoosier Rails” program will take place on Sunday, February 26, 2017. Come and ride with us one last time in the former Santa Fe Big Dome “Summit View” and see Indiana’s beautiful countryside. Tickets can be purchased through Amtrak. Through February 26, more information our “Riding the Hoosier Rails” program can be found at www.hoosiertrain.com. There’s a lot of interesting things to see along the rail corridor between Chicago and St. Louis, Missouri — but don’t worry — the APRHF Rail Rangers have you covered. We are partnering with American Rail Excursions to offer four trips this spring and summer on this route. Between Chicago and Joliet, our Interpretive Guides will explain the importance of the historic Illinois & Michigan Canal, which you will be able to see our your window. Further south, the tracks begin to parallel Historic U.S. Route 66. We’ll tell you how this revolutionized travel in the United States. Don’t forget about the important Abraham Lincoln sites in Central Illinois and the Gateway Arch as we approach St. Louis. Trips dates include the following: Wednesday, May 3, 2017 (Chicago to St. Louis), Tuesday, May 30, 2017 (St. Louis to Chicago), Saturday, July 8, 2017 (St. Louis to Chicago), and Sunday, July 16, 2017 (Chicago to St. Louis). Note these excursions are part of a larger tour package offered by American Rail Excursions and local travel just between Chicago and St. Louis may or may not be allowed by American Rail depending on ticket sales. For more information on these trips and a ticket order form, check out www.railrangers.org and click on the “upcoming events” tab. For the third year in a row, the APRHF Rail Rangers are partnering with Zephyr Route Tours to provide a day-trip for passengers on Saturday, June 24, 2017 between Chicago and either Galesburg or Quincy/Hannibal. 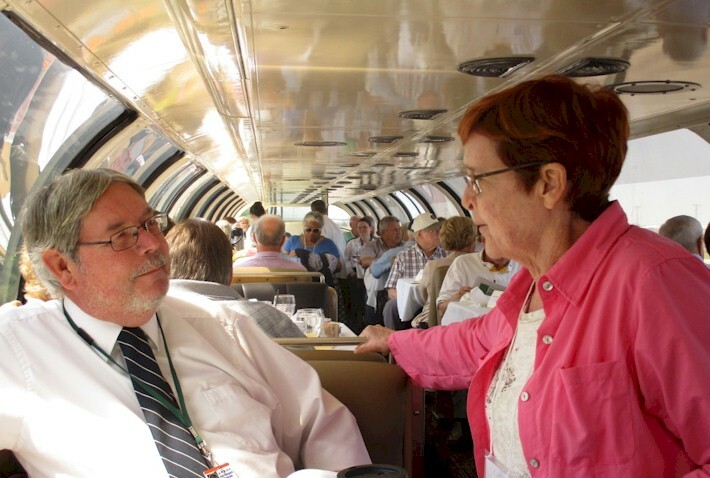 After a 162-mile ride in the dome car, Galesburg-bound passengers will get approximately 8 hours to spend on their own at the annual Galesburg Railroad Days Festival. Those wishing for a longer ride can stay on the train and head to the “end of the line” at Quincy, Illinois… and then to Hannibal, Missouri by motorcoach to explore the many Mark Twain sites – including an optional riverboat cruise on the Mississippi River. All passengers will return back to Chicago on the dome car while eating a dinner cooked fresh aboard the train. This trip SOLD OUT in 2015 and 2016, and is expected to sell out again in 2017 — get your tickets early! 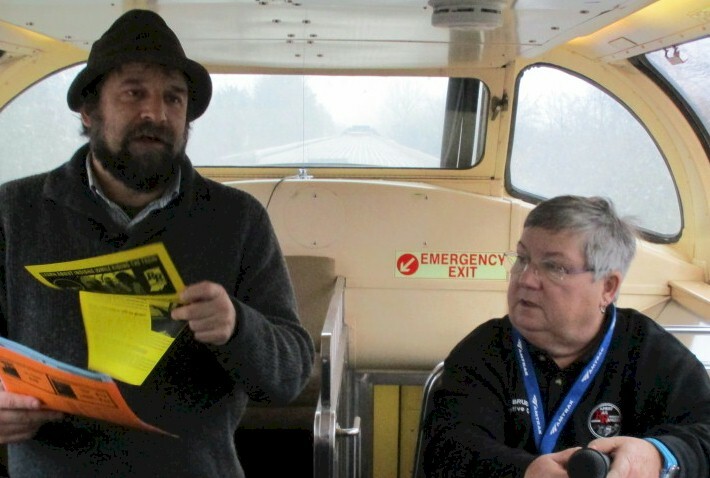 APRHF Rail Rangers’ Interpretive Guides will cover such topics as the Cherry Hill Mine Disaster, Galesburg’s connection to Abraham Lincoln, why there are two high bridges west of Princeton, and how one town was transformed into Superman’s hometown a few years ago. More information can be found at www.railrangers.org. The APRHF Rail Rangers have agreed to a test partnership deal with the 20th Century Railroad Club out of Chicago, Illinois. We will have one of our Interpretive Guides on their coach Amtrak charter between Chicago and Galesburg, Illinois on Saturday, June 24, 2017. This is an economical way to head out to the popular Galesburg Railroad Days in Galesburg, Illinois. Passengers will be treated to narration by the Rail Rangers between Chicago and Galesburg — and then have about 8 hours on their own to explore around the many exciting attractions at Galesburg Railroad Days. Options include a tour of the BNSF Hump Yard, checking out various other railroad equipment on display, a carnival, a model train show, and much more. We would like to thank the 20th Century Railroad for inviting the Rail Rangers aboard for this trip. Guides will also be selling route guidebooks with a percentage of sales going to the 20th Century Railroad Club. More information about ticketing can be found at www.railrangers.org. The APRHF Rail Rangers are partnering with American Rail Excursions to provide passengers two chances to ride in a historic railcar on the extremely scenic Chicago/Milwaukee to Twin Cities rail corridor this summer. Mark your calendars and come and ride with us northbound from Chicago to St. Paul on Sunday, July 9, 2017 or southbound from St. Paul to Chicago on Saturday, July 15, 2017. Our Interpretive Guides will be aboard to talk about the busy urban corridor between Chicago and Milwaukee, the scenic Wisconsin Dells, the rolling hills in the “Driftless Area” of Western Wisconsin, and the Mississippi River in Southeast Minnesota. Note that this is part of a larger package to Glacier National Park being offered by American Rail Excursions and local riders between Chicago/Milwaukee and the Twin Cities may or may not be allowed depending on how ticket sales are going. For more information and a trip order form, check out www.railrangers.org and click on the ‘Upcoming Events” tab. Get in early on this one… as this will be a sure sell-out!! The APRHF Rail Rangers’ Signature Trip of the 2017, in partnership with Zephyr Route Tours, will feature a return to La Plata, Missouri (headquarters of the APRHF) by private rail car. This is a four-day package that will be offered Saturday, August 19, 2017 to Tuesday, August 22, 2017. 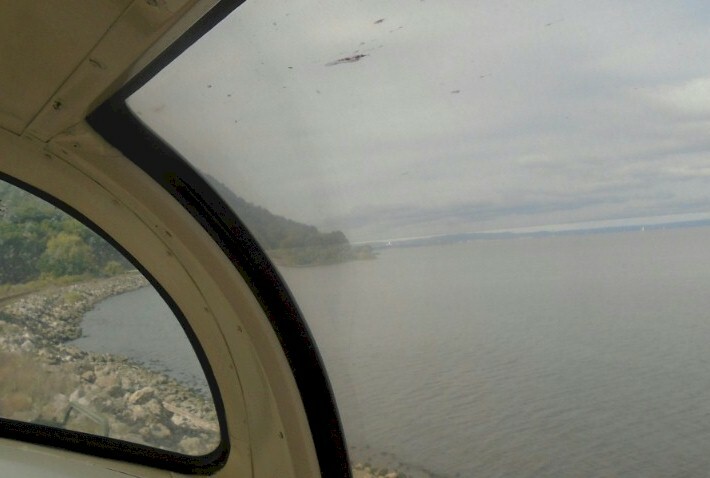 Day #1 (Saturday, August 19) will feature an afternoon departure from Chicago and a 300-mile ride to La Plata, Missouri in a full-length dome car. 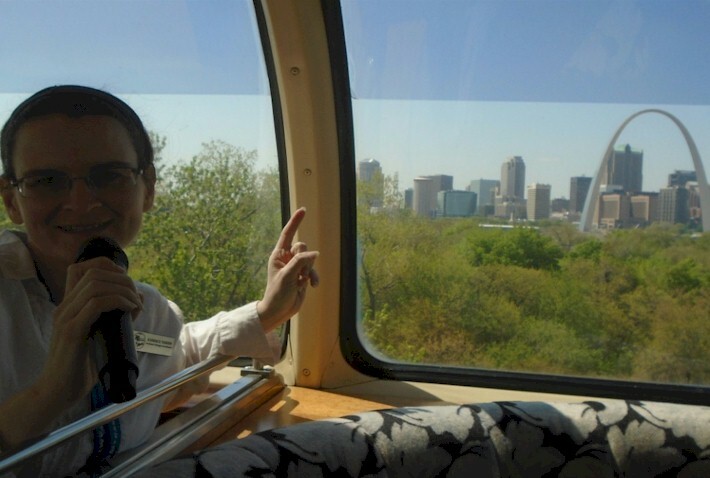 Enjoy dinner and dessert while enjoying narration from APRHF Rail Rangers’ Interpretive Guides. Topics will include the Mississippi River, Old Fort Madison, the rolling hills of Northeast Missouri, the Mormon Pioneer National Historic Trail, and much more. You will spend three nights at the rail-themed Depot Inn & Suites in La Plata, Missouri. Day #2 (Sunday, August 20) will feature two optional guided tours of Northeast Missouri including some railfan hot spots and a trip to see the stunning Thousand Hills State Park and its’ Native American petroglyphs. The main event is Day #3 (Monday, August 21) as we head to either Columbia or St. Joseph (depending on weather/sky cover) to see the total solar eclipse. You’re right in the 100% eclipse zone! We’ll head back to La Plata for a farewell cookout dinner on the overlook at the BNSF tracks. On Day #4 (Tuesday, August 22) head back to Chicago in the same full-length dome car enjoying some quiet one-on-one time to chat with Rail Rangers’ Interpretive Guides. Pricing is $799 double occupancy and $969 single occupancy. More information about this trip can be found at www.railrangers.org. THIS TRIP IS LIMITED TO JUST 35 PASSENGERS! SECURE YOUR SPACE SOON! One of the best times of the year to travel on the scenic train route between Chicago and St. Paul is during the fall colors season. Once again, the APRHF Rail Rangers is teaming up with Zephyr Route to offer passengers the opportunity to experience a weekend round-trip journey of over 800 miles for a little “leaf peeping” along the Mississippi River and down time in the Twin Cities. Board from Chicago, Glenview, Milwaukee, or other points in Wisconsin. Mark your calendars for this weekend package that runs from Friday, October 13, 2017 to Sunday, October 15, 2017. Guests will receive two nights at a hotel in Downtown St. Paul. Explore the Twin Cities at your own pace on Saturday, October 14, 2017, or take an optional guided tour for part of the day around St. Paul. This trip SOLD OUT in both 2015 and 2016 and we expect the same this year. In fact, due to pre-orders… we only have about 25 seats left at the present time… so jump in now and come see the fall colors with the Rail Rangers. More information about this trip and ticketing information can be found at www.railrangers.org – just click on the “Upcoming Events” tab. THIS TRIP IS HALF-WAY TO BEING SOLD OUT ALREADY! Yes, December 2017 might seem like a long ways away at this point… but the Friends of the 261 are already planning for their annual North Pole Express event. 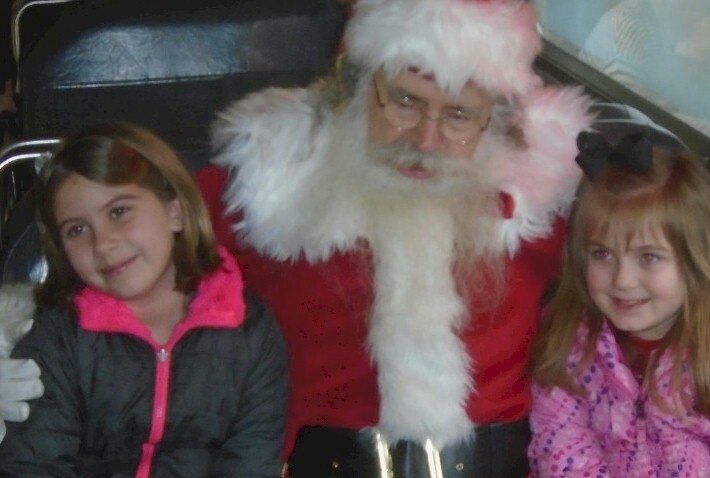 Numerous trips to see Santa, pulled by the Milwaukee Road 261 steam locomotive will be offered during the first two weekends in December… but you might want to mark your calendars for Saturday, December 2, 2017, as this will be the date numerous APRHF Rail Rangers’ Interpretive Guides will be putting down their microphones to become car hosts once again. This will be the third year in a row that our guides have assisted in this important fundraiser for the Friends of the 261. Trips depart from St. Paul Union Depot. More information, including about ticketing, will be provided as we get closer to the fall. More details can also be found at www.railrangers.org. Several additional trips are currently in the planning phase and will be announced later. For more information about the APRHF Rail Rangers program, you can contact Executive Director Robert Tabern by e-mail at railrangers@rtabern.com. 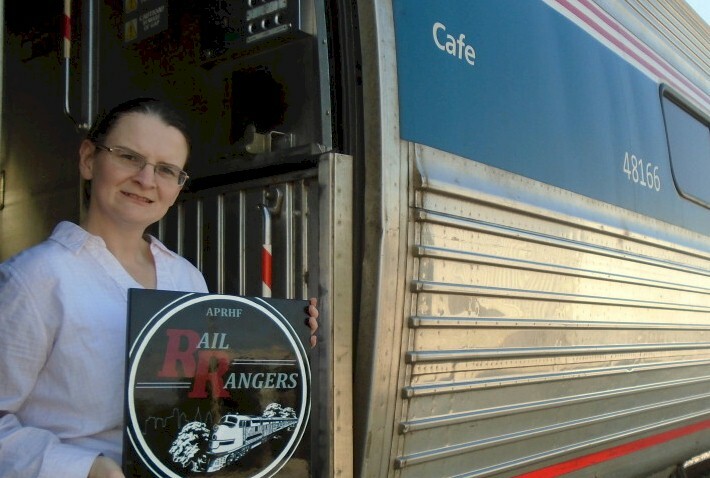 The APRHF Rail Rangers is primarily funded by donations from passengers and our own Interpretive Guides, plus through the sale of rail route guidebooks through our website at www.midwestrails.com.